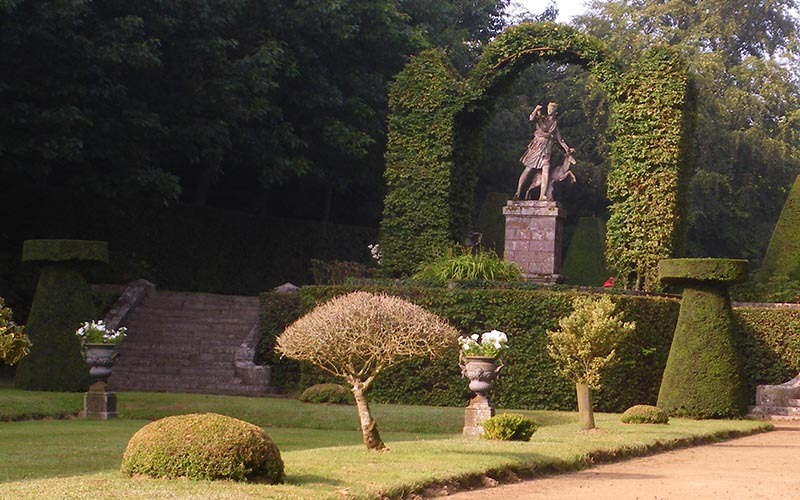 The park and gardens of Caradeuc welcome you from July to August, as well as for special events such as the European Heritage Days or Rendez-vous aux Jardins. 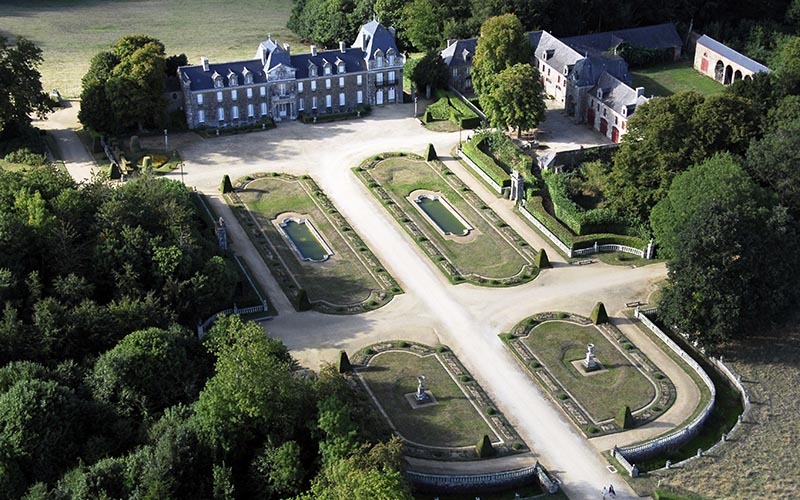 It is recognized by the French state as a Remarkable Garden and a national heritage site. 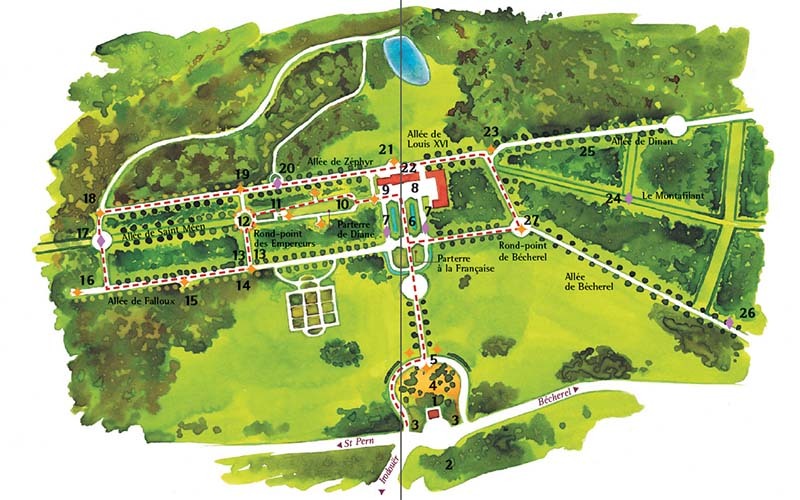 The park and gardens of Caradeuc were transformed in 1898 by the landscape architect Édouard André, according to the principles of the French classical garden. 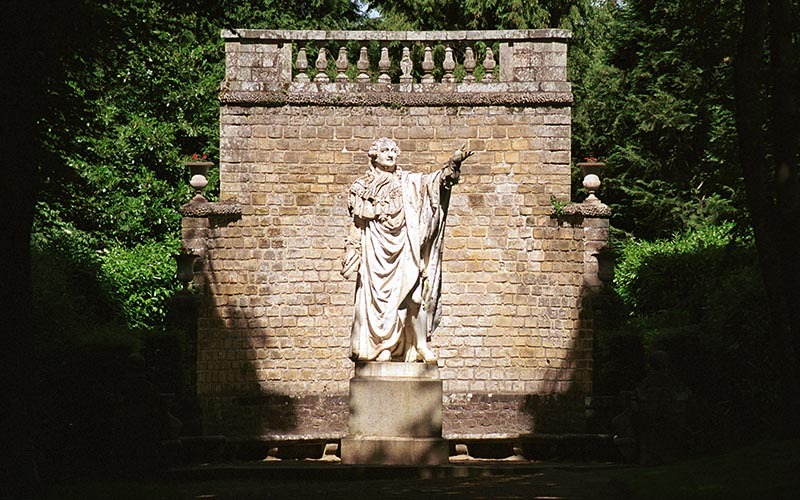 The surroundings of the manor are embellished by flowered lawns; farther from the château, wooded alleys are punctuated by follies — these monuments shelter statues of historical or mythological characters. Jacques de Wailly added the finishing touches in the 1950s when he developed the park towards the east. It is then that the grand white marble statue of King Louis XVI was installed. Those who enjoy greenery and winding paths will descend to the pond below the terrace to discover a very different point of view on the northern facade of the château. While walking, they'll pass by a grove of Californian redwoods, whose large trunks and red bark are easily distinguished from local species'. Alternatively, such visitors might choose to climb up the Montafilant hill to the east, which is planted in sessile oak. 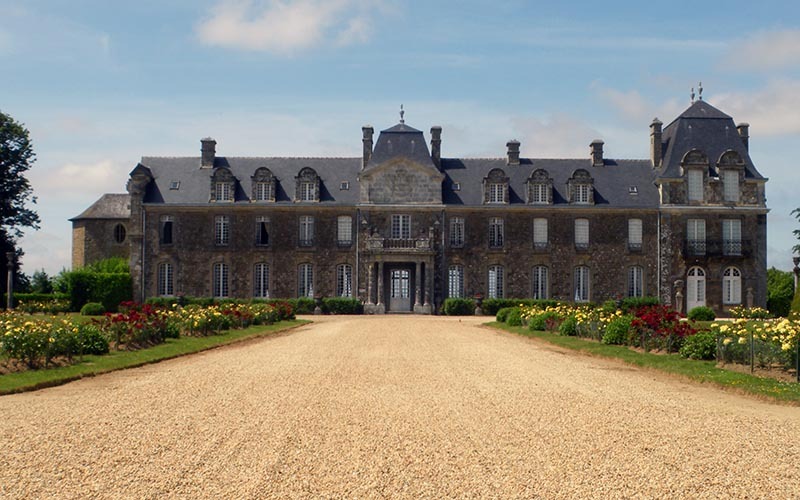 The château was built during the 18th century for Anne Nicolas de La Chalotais — a Councillor of Request at Brittany's parliament. Its facades and roofing are listed as a heritage monument. It is still inhabited by La Chalotais' heirs and is not open to the public. According to Ovid, Philemon and Baucus welcomed Jupiter and Mercury, travelling disguised, in their humble dwelling. They were rewarded after their death and became an intertwining pair of trees, an oak and a linden. From the bench beneath the arbour, one can see, behind the majestic lions, the main alley leading to the château's southern facade and bordered with linden and lawns. Behind the moats, Édouard André built a classical parterre in from of the château. Surrounded by some 500 bannisters, it is divided in four compartments bordered with red and yellows roses, laurestine shaped in a hemispheric fashion and pyramidal yews. Two large stones vases sit in the first compartments. The next two, which are larger, each contain a pond of the same shape. The Regency style château is build around two pavilions: one in the middle and the other to the east. To the west, the missing pavillion is hidden by laurels. On the central one's frontispiece, there are the arms of the La Chalotais and Martel families, as well as their motto: "Stop your heart" — which can be rephrased as "Let reason prevail over feelings". 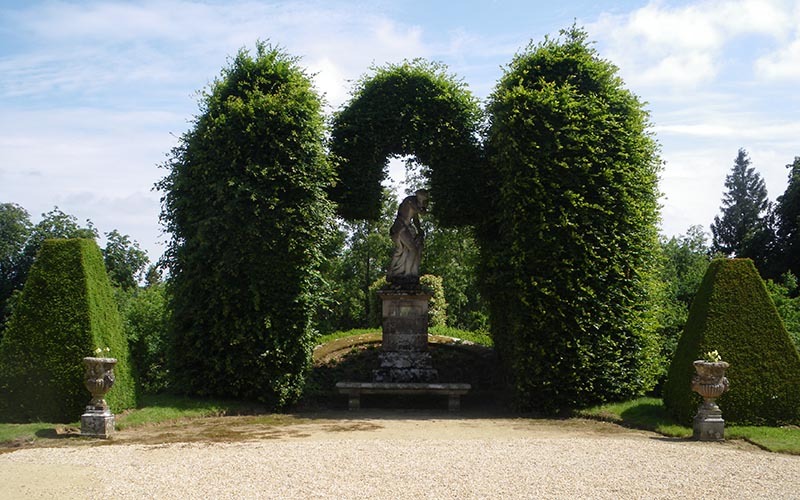 To the west of the château is the "green carpet", or Diana's lawn, which is shaped like a lyre to increase its perceived length. It is bordered by northern red oaks, planted behind a row of shaped hornbeam. The lawn's internal border is marked by laurestine and English holly. These two granite bins near the lawn entrance come from Rennes' old prison. 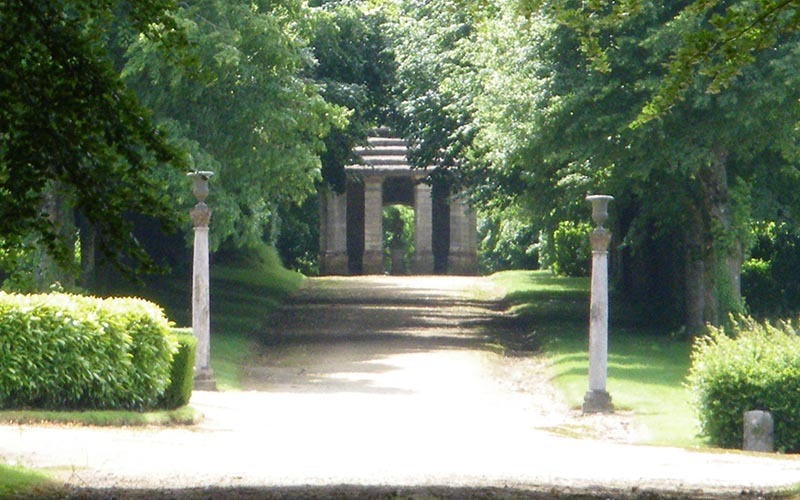 At the end of the lawn, on a terrace between granite stairs, stands a statue of Diana hunting deer. It is a copy of the statue offered by Pope Paul II to King Henri II, which was placed successively in Fontainebleau, the Louvre and Versailles. Many European princes copied the statue for themselves, and René de Kernier did the same. 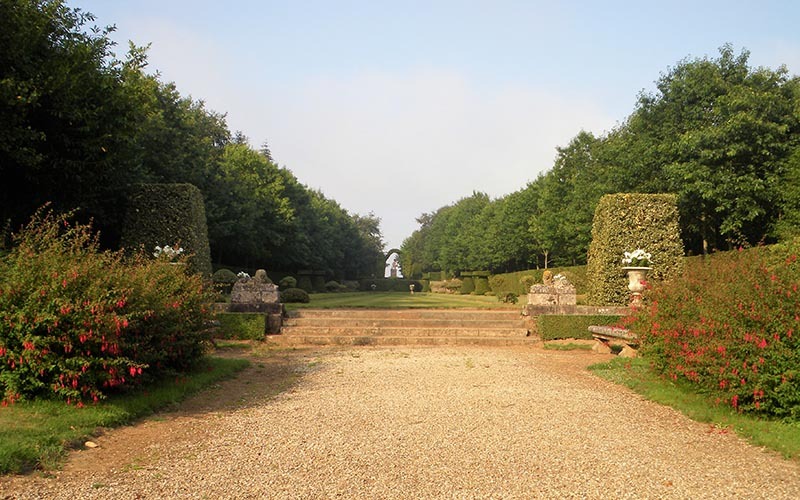 Eight recesses in the hedge of Portugal laurel shelter busts of Roman emperors and empresses. Sculpted in Carrara marble during the 17th century, they stand on granite pillars. At the centre of the roundabout, there is a granite trough which also comes from the old prison on the road to Fougères, in Rennes. After the redesign of the château's northern facade in 1898, the previous arcade had been kept. 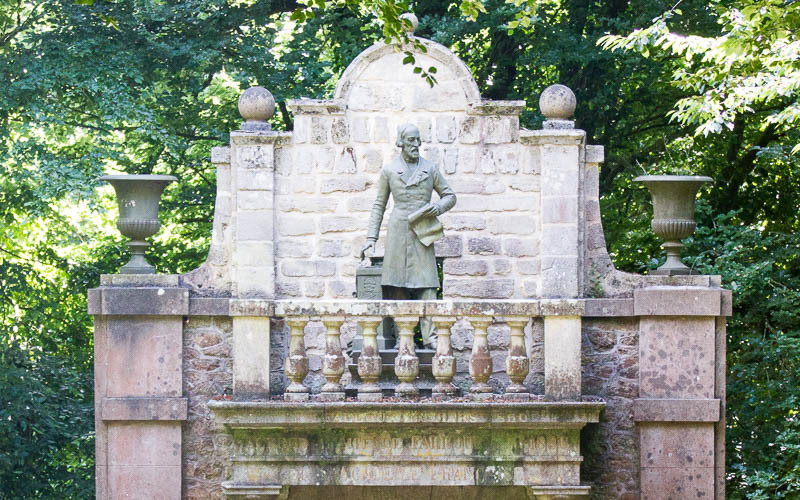 It was reassembled in 1913 to house a statue of the Count of Falloux, whose wife inherited the estate. He was a Minister of Education and gave his name to an 1850 law that mandated the opening of schools for girls in towns of more than 800 souls. 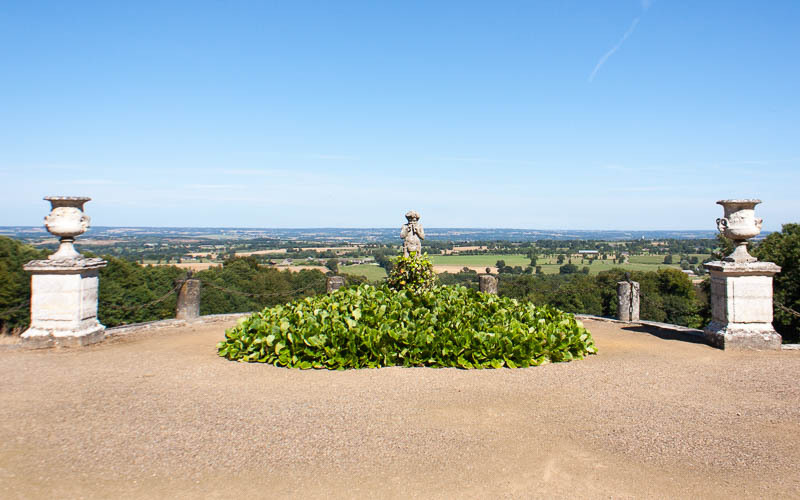 This small circular folly houses a statue of Zephyrus, the Greek god of the mild west wind. This wooden depiction was sculpted in 1984 by Deffains. From the building, a linden-planted alley leads to the northern terrace. The terrace, bordered with chaînes from Rennes' city hall square, offers a unique panorama of the Rance river's valley. To the left, the moors of Plélian. To the centre, the spires of Dinan and Lanvallay. To the right, the town of Évran and the plains of Combourg. Two sphinges, with a lion's body and a woman's head, guard of the terrace and the statue of Pan, half-man, half-goat, god of shepherds. An alley planted with European beech leads on to the grand statue of XVI at the opening session of the États généraux. It was ordered by the city of Rennes in 1826 for the city hall. By the time the sculptor, Molchenet, had finished his work, the revolution of 1830 had rendered the project obsolete. Thus, the statue was kept in the cellars of the city for more than a century before it was loaned and brought to Caradeuc in 1950. 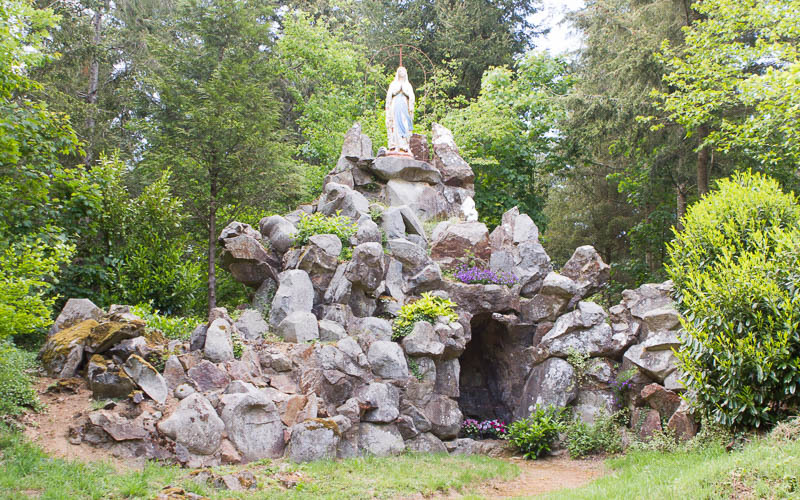 Near to the end of the Bécherel alley, Marie-Charlotte de Falloux built an artificial grotto topped by a statue of the Virgin Mary, as an act of devotion after the Marian apparitions in Lourdes. "Amicis pateant fores" : "To friends shall doors be open". 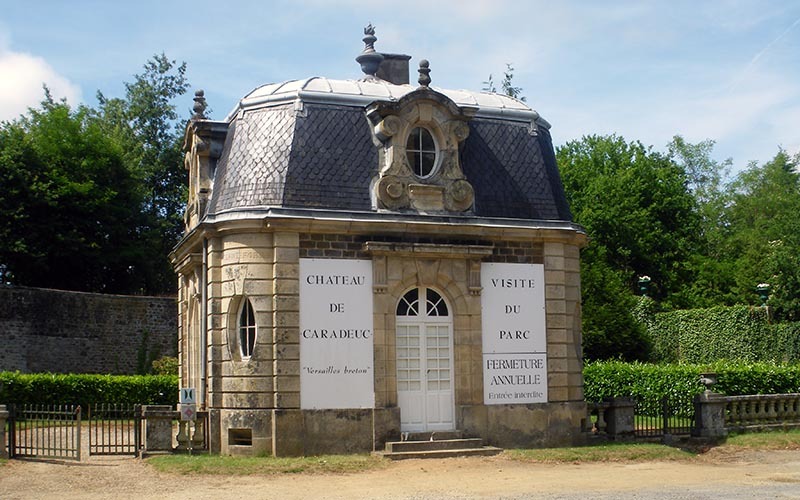 Such is the motto written on the gatehouse of Caradeuc, which is the replicate of a folly in Bagatelle Park (Paris). 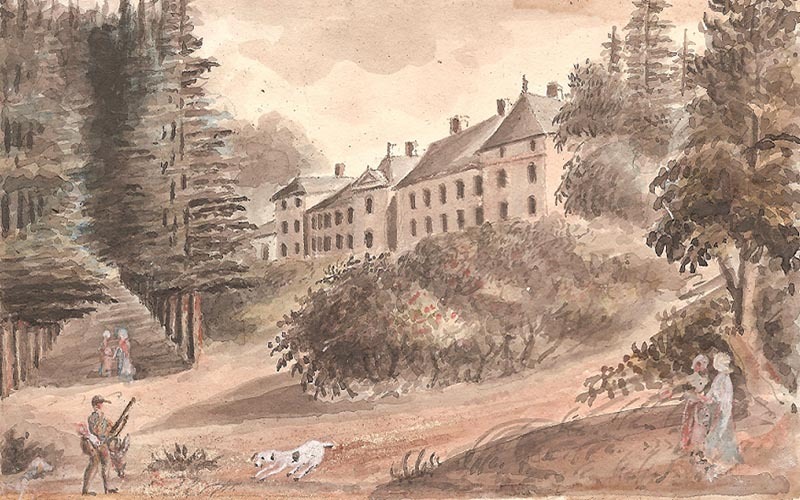 The Caradeuc château was built during the first half of the 18th century at the request of Anne-Nicolas de La Chalotais, who belonged to a family of Breton MPs and was imprisoned for opposing King Louis XV. La Chalotais used his lands for agricultural research and he had an enclosed vegetable garden built just west of the manor. 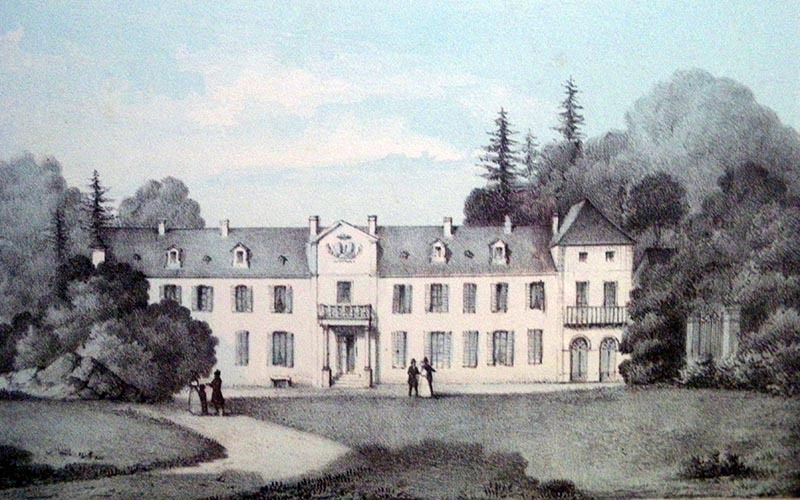 The château was later surrounded by an English style park, in line with the trends of the early 19th century. 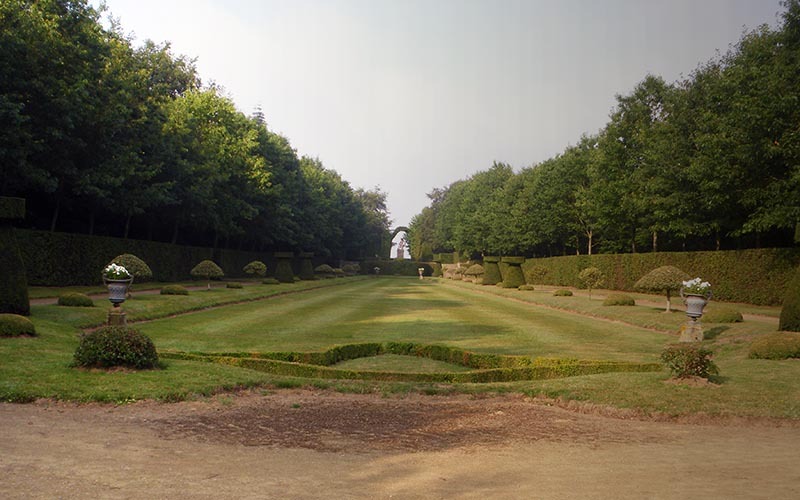 In such parks, the alleys recreate natural shapes while being carefully designed to ensure that the visitor views the landscape's majors elements, especially the château, at their best. La Chalotais' great-grandnephew, René de Kernier, inherited the estate in 1882 and decided to redesign entirely the park in the French classical style. To accomplish this project, he called upon Édouard André in 1898. 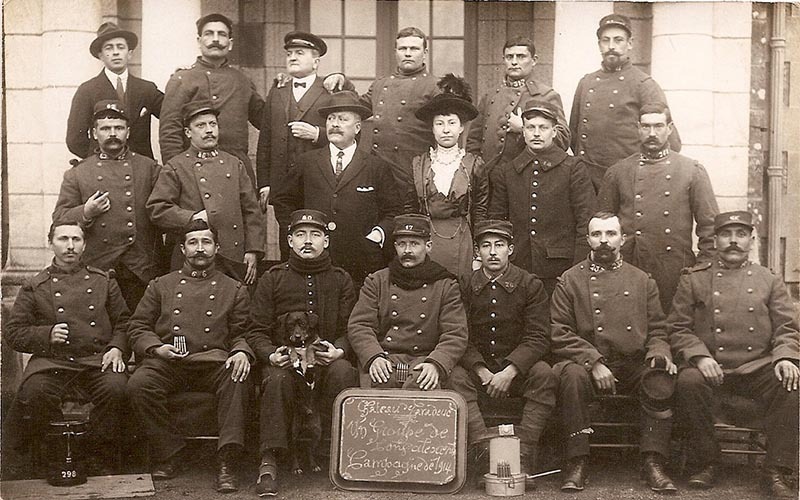 On this picture, René and his wife Jeanne are surrounded by poilus (Word War I infantrymen) who were recovering from their injuries at Caradeuc. 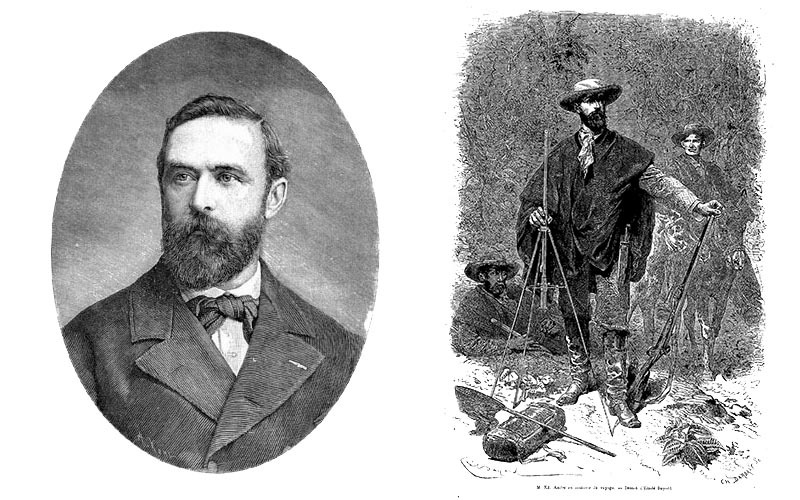 The landscape architect Édouard André was an apprentice of Jean-Charles Alphand during the construction of the Buttes-Chaumont park in Paris, before striking out on his own throughout the world — from Lituania to Uruguay. Specializing in horticulture, he brought many exotic plants back to Europe including Anthurium Andreanum. 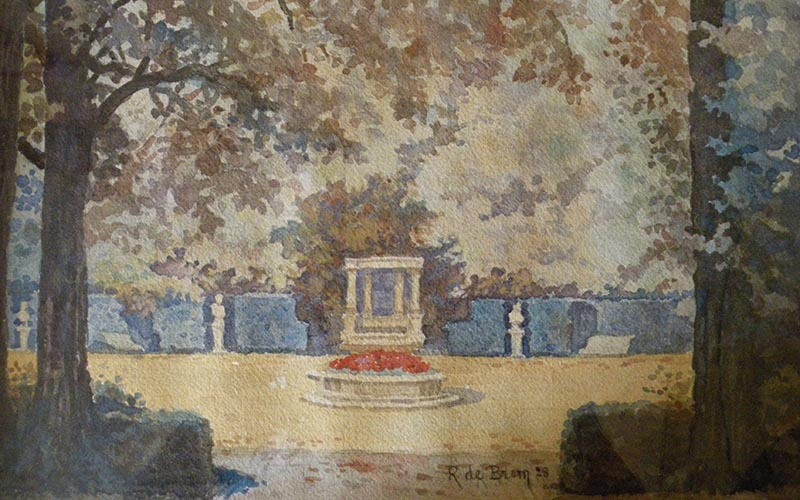 For René de Kernier, André designed a large wooded park following the tiering principles of the French style: near the manor, lawns, flower beds and water features; farther, flowers are replaced with groves and wooded alleys. A particular care is paid to the perspectives. The long alleys are straight and end upon a monument that hides either an elevation change or the end of the path. 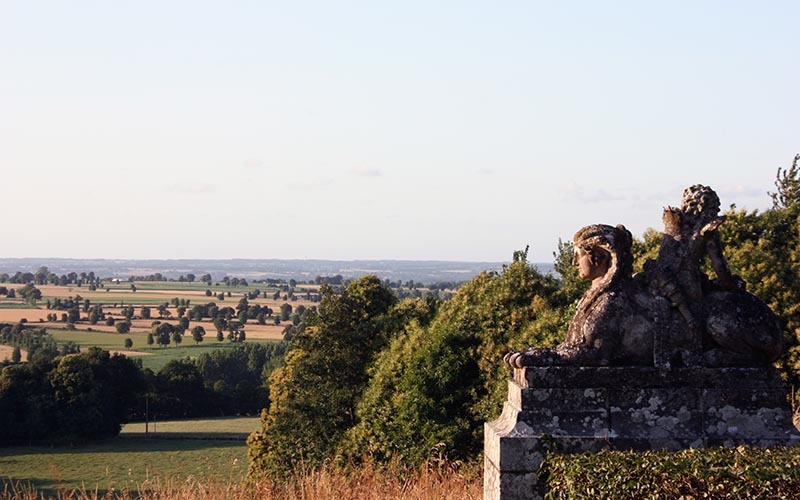 Two panoramas are especially noteworthy: the terrace to the north of the château that overlooks the Rance river's valley and the view beyond the westernmost belvedere from which the hills of Moncontour can be seen.